Moroccan Accelerated – Deeper, Darker And More Luxurious Than Ever | [All Things Tanning] For Tan Fans! MoroccanTan Press Release August 2017. The secret to the enviable radiance behind a nourished and deep all-over glow has been discovered by industry leaders, MoroccanTan. 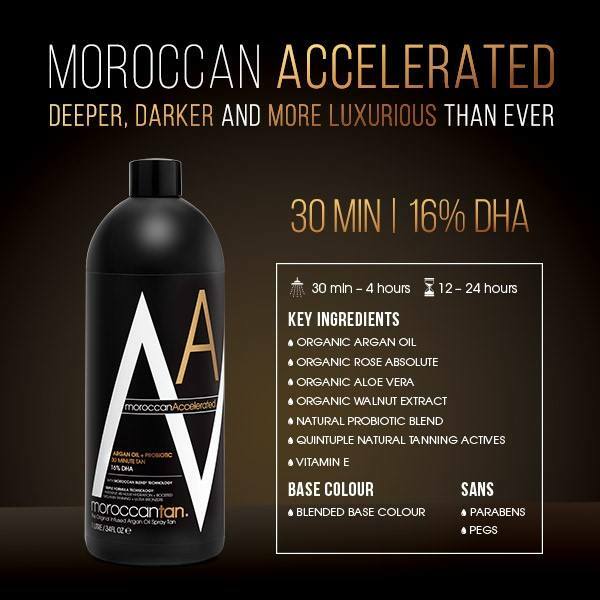 In a blend of organic Argan Oil and a powerful, natural probiotic blend, the brand’s richest and darkest application yet comes in the form of MoroccanAccelerated. Infused with luxurious hero ingredient, organic Argan Oil, and a powerful probiotic blend, the newly formulated MoroccanAccelerated works to enhance the radiance of the complexion by stimulating the skin’s natural defences. The MoroccanAccelerated 30-minute formula, suitable for all skin types, promotes vitality and delivers a darker, more natural and intense finish, with the skin emerging supple, smooth and deeply bronzed. Utilising a mixed blend base, the product is complementary to both warm and cooler skin tones – minimising adverse effects in terms of colour, or over processing. Containing new natural odour inhibitors, delivery systems including Jojoba Flora Ester and DMI (ensuring faster absorption of DHA), and Melanin Tanning technology, the natural components of the newly formulated product work to hydrate and replenish the skin. The 16% DHA and amalgamation of natural, nourishing properties, make this high performing 30-minute tan sure to become a fan favourite.